OP2855. DER FERNE KLANG (Schreker), Live Performance, 1989, w.Michael Halász Cond. Hagen Opera Ensemble; Elena Grigorescu, Thomas Harper, etc. (Germany) 2-Marco Polo 8.223270/71. Brilliant sound! Excellent, ever-so-slightly used copy. “The premise of DER FERNE KLANG is simply told. A composer forsakes a woman’s love for a chimeric sound that is but the distant echo of her presence. It is a tidy plot for an opera, a love story of tragic deferral and a paradoxical meditation upon the vanities of l’art pour l’art. 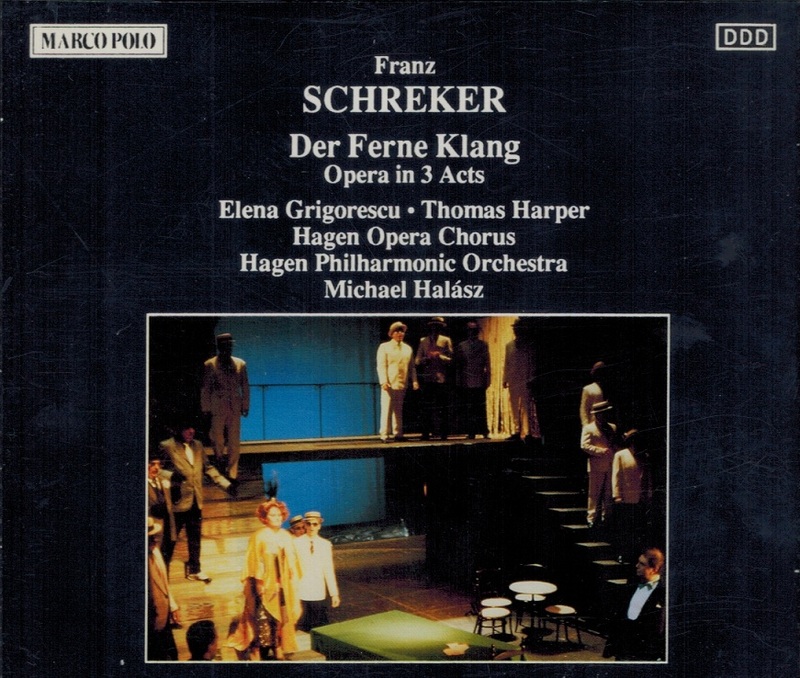 But DER FERNE KLANG is only partly an opera about the composer Fritz and that elusive ideal that shimmers like a mirage just beyond his grasp. It is also the story of Grete, about her exploitation by a grasping world and her retreat into an inner world of dreams. Two case studies, if you will; two tales of neurosis, delusion, and hysteria. DER FERNE KLANG is that, too, for Franz Schreker was very much the contemporary of Sigmund Freud. Schreker was also the contemporary of Gerhart Hauptmann and August Strindberg, of Knut Hamsun and Maurice Maeterlinck, and DER FERNE KLANG evokes social and psychological environments of extraordinary power from the shabby milieu of faded middle-class respectability to the glittering duplicity of the demi-monde, from the brittle sobriety of the modern metropolis to the sublime indifference of the natural world. In no other work—save perhaps Berg’s WOZZECK—is there such an intriguing blend of German romanticism, naturalism, and expressionism, with hints of the Neue Sachlichkeit [new objectivity] to come. 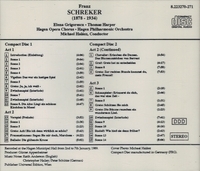 And yet Schreker is a very different composer from Berg, and DER FERNE KLANG is the product of a very different set of aesthetic assumptions that give its composer a unique position among Vienna’s modernists. With DER FERNE KLANG, Schreker discovered his remarkable capacity for translating his own experience and psychological insights into a musical and dramatic language of astonishing originality. And in DER FERNE KLANG, as in most of his subsequent librettos, that experience coalesces around a musical symbol. Every scene, virtually every page, is a counterpoint of the near and the far. What we hear in the distance is both ethereal and mundane: a composer’s imagined harmonies or the clatter of a game of skittles; the cries across a Venetian lagoon or fragments of an opera premiere heard through an open window. Schreker’s polyphony is not only physical and spatial, it is also temporal, a conscious, often ironic juxtaposition of styles and eras; here a folk song or Ländler, there a Czardas or an old-fashioned ballad. It is a musical fabric of disjunctions and pluralities not unlike that which we find in Mahler; and as with Mahler it is the music of an outsider, heard from the periphery of Vienna’s cultural mainstream. Schreker was born in Monaco, the offspring of sharply contrasting worlds. His father, a Bohemian Jew, had risen to great prominence as a portrait photographer accredited to numerous European courts; his mother, a second, much younger wife, was a devout Catholic and scion of Austria’s minor aristocracy. Schreker led an unsettled childhood as the growing family was caught up in his father’s inexorable professional decline that led from fashionable watering holes on the Riviera and the Adriatic to the back streets of provincial Linz. The father’s sudden death in 1888 thrust his widow and her four children into dire poverty, the memory of which would haunt the composer for the rest of his life. It is little wonder that his operas so often thematicize the illusory nature of happiness. There is no nostalgia in this music, none of the cozy warmth we associate with Richard Strauss or Erich Wolfgang Korngold. It is beautiful and lush, to be sure, but Schreker does not linger over long-breathed melodies or serve up satisfying cadential climaxes. This is music that is conscious of its fatal beauty, music that cautions as it beguiles. It is open-ended, often fragmentary, in rhythmic flux, tailored to the fluid, mercurial vagaries of the heart and the mind. It is also the music of a conjuror. At the beginning of the second act Schreker creates the intoxicating ambience of an elegant Venetian bordello with a swirling mass of discontinuous on-and off-stage soloists, choruses, and instrumental ensembles. This is the language of the cinema, an aural cinema that literally anticipates by a decade or more the principle of montage with its establishing shots and jump cuts. Schreker’s music is very much like the unblinking eye of a camera lens. But while it is curiously detached it is also profoundly compassionate, especially when, as if out of the corner of the frame, Schreker focuses upon what he once called ‘those tragedies that brush past us and now and then entangle us, if only fleetingly, in their drama’. There is nothing judgmental or patronizing about his portrayal of Grete’s parents and the innkeeper in the first act, or the unnamed shady character in the third—all are keenly observed and drawn with striking economy. Then there is the mastery with which he evokes the threadbare lives of two broken old men, Dr. Vigelius and the itinerant actor, at the beginning of the third act. ‘How the world sins - and we along with it’, Vigelius says in that scene. Berg’s Schigolch (in LULU) is unthinkable without Vigelius, just as Grete is a prototype for Lulu. These and numerous other influences upon Berg’s work arose from his close study of DER FERNE KLANG, for which he prepared the piano vocal score. - Christopher Hailey, School of Historical Studies, Institute for Advanced Study, Princeton.